Debra exhibits annually during the South East Open Studios fortnight in June from her own Gallery at Dibgate Farm. 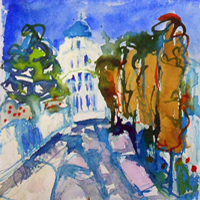 paintings at the The Llewellyn Alexander Gallery in London and the Royal Watercolour Society Gallery at Bankside. Debra also appeared on the popular television programme Watercolour Challenge. ​Debra has also exhibitied on a regular basis at the Visual Arts Centre Punta Gorda, Florida. Debra was also the featured artist in Kent Life, June 2015.